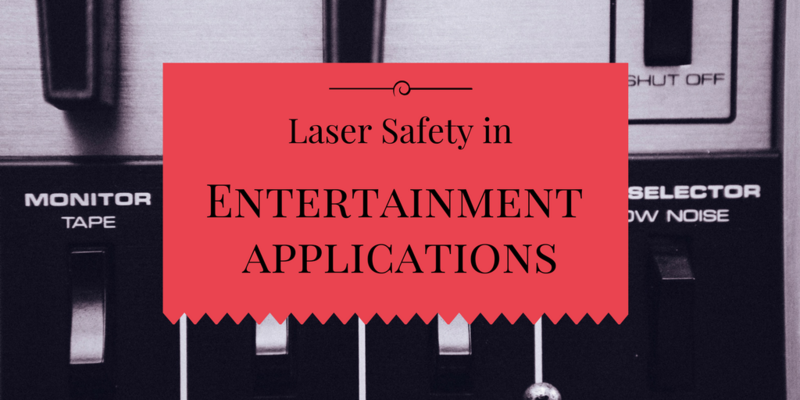 High power lasers are routinely used in entertainment environments as a special lighting effect. Historically such lasers could only be used in situations where the budget, infrastructure, (namely power supply and cooling), and space permitted. In recent years, however, these barriers have disappeared with the proliferation of low-cost solid-state laser light sources that now dominate this sector. This has created new opportunities in how the effects are being used, as well as who is able to now use them. The greater number of lasers being used on single installations has increased the need for better awareness of the exposure risk, and requirement for a robust installation protocol. In a change to earlier practice where a dedicated laser operator and control system were used to operate the laser effects, many of the latest generation laser lighting effects are designed to operate directly from the same control systems as normal stage lighting effects. This has benefits from a creative perspective, in that that a lighting designer no longer needs to interface through a third party dedicated laser system operator. But the downside is that the lighting designer may not necessarily be familiar with the risks in using Class 4 laser products. A lack of familiarity of exposure risk also exists for another new group of users, which with laser projectors costing only a few hundred dollars, and being widely available online through disco / stage lighting distributors, can install laser effects in small venues and for mobile discotheques. At the budget end of the market are multicolour laser effects projectors that produce moving beams and pre-programmed animated graphics and text. These devices typically output 1W – 2W, and operate automatically in sound-to-light mode. Exposure potential from laser lighting effects can be considered when the characteristics of how the effects are produced is understood. The majority of lighting effects created at laser installations are through movement of two mirrors placed orthogonally, so as to move the beam freely about an imaginary x and y-axis. The maximum extent of beam deflection is typically between 50° – 60° optical. In practice this leads to typical scan across-the-pupil exposure durations of a few µs to several hundred milliseconds, depending on the content material. Stationary beam creation is also possible if the control signal is held constant, or fails. The other popular method of creating laser effects is achieved by passing a laser beam through a transmissive diffractive optical element (DOE), (also referred to as a diffraction grating), that splits and deflects the beam creating arrays of lesser-powered beams creating a geometric pattern. The DOE is normally attached to a motorized substrate, typically able to rotate from stationary through to 10rpm – 20rpm. The characteristics of the DOE determine the visual appearance of the laser effect produced. The time it takes a diffracted beam to scan across-the-pupil distance typically varies from a few milliseconds to being stationary. The majority of exposures occur in the millisecond and microsecond domain, meaning for MPE comparison radiant exposure expressed in J·m-2 is used, however, for the purposes of risk assessment, it is more convenient to consider the exposure having been converted to a peak irradiance. The hazard distance (NOHD) of most lasers used for lightshow applications normally exceeds the length of the working, (and viewing), space they are being used at. Table 1 shows the NOHD, along with the irradiance at five distances that may be representative for four typical laser output powers used in this sector. For each distance, a 0.25s and 1ms dose are considered, to give an indication of how many times in excess of the MPE such an exposure may be at that distance. The figures in Table 1 demonstrate how the irradiance present at the exposure distances is significantly higher than the 25W·m-2 and 101W·m-2 MPE limits (0.25s and 1ms respectively). Areas within several metres of the source are particularly high risk exceeding the MPE by several hundred, if not, thousand times, depending upon the laser power and duration. Such viewing conditions could occur for lasers positioned on, or directed at the stage from the vicinity during a poorly managed performance or rehearsal. It is also possible that the exposure could occur when the scanning position of the lasers are being lined up during the installation phase, where a stage may be occupied by technicians and crew unaware of the exposure risk. With laser effects capable of producing exposures with peak irradiances of several kW·m-2 over a considerable distance from the source, controls are necessary to limit exposure to levels considered safe for viewing. In the first instance, the user and those sharing the environment lasers are being used in, need some appreciation of the risk and what precautions should be typically adopted. As with most projects, spending time at the early stages of development helps to identify and address issues that could become more significant if left unchecked. In an ideal world, the laser provider would be contacted early on in a production’s development, be provided with a full brief from the client, and full information about the rest of the production’s implementation. It is recognised that events rarely function like this, which is no fault of the laser provider, but instead the nature of the sector. This means the successful laser provider has to remain alert, and often has to anticipate factors that could affect safe laser use. Even the best planned productions can be dynamic environments with tweaks and changes happening right up to the last moment. Basic rules however help to keep a laser install on track and minimise the risk to workers and audience alike. At no point should users neglect the fact that laser lighting effects are a special effect, and should be regarded as such, needing appropriate precaution to be taken for their safe use. Presently, two major standards organisations have working groups producing specific guidance for this sector. ANSI through Z136.10 – Safe Use of Lasers in Entertainment, Displays and Exhibitions (currently under development), and IEC through IEC/TR 60825-3 – Guidance for Laser Displays and Shows, will each address the issues that have become apparent as laser light show technology has become more accessible, and is being used in ways that would have just a few years ago been impractical. It is hoped that when the new guidance is available that it will provide end users and safety advisers alike with an authoritative reference to best practice for this application of lasers. James Stewart works for LVR Optical, based in the UK, as laser safety practitioner with a keen interest and experience in managing entertainment applications using lasers. He is the project lead for IEC/TR 60825-3. Interested in Laser Safety? To learn more about Laser Institute of America’s International Laser Safety Conference, visit the conference website.